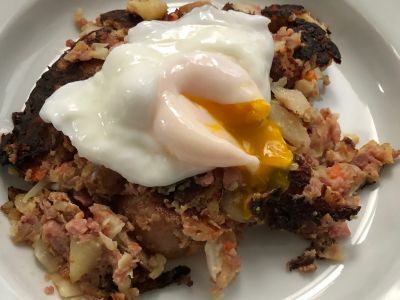 There are so many ways to use poached eggs like Corned Beef Hash or Eggs Benedict. But they can sometimes be an intimidating part of a dish. They don't need to be. 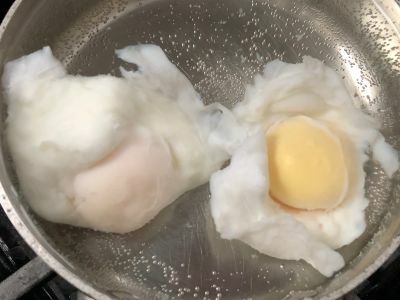 We will show you not only how to make perfect poached eggs, but also how to make them ahead of time and take all the stress out of the process. Ever wonder how they make all those poached eggs in a restaurant and have them all come out at the same time. We'll show you. So get over your fear of poached eggs and learn how to be the envy of your breakfast club. Enjoy! 6. If you are not using the eggs immediately, another bowl large enough to hold the eggs. 1. 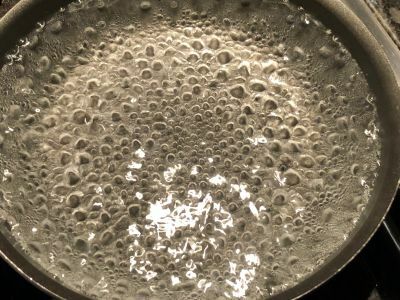 Add 1 1/2" of water to a frying pan and heat it to just below boiling, about 200° F.
2. If you are not going to use the eggs immediately prepare a bowl by adding enough cold water to it to hold the eggs. 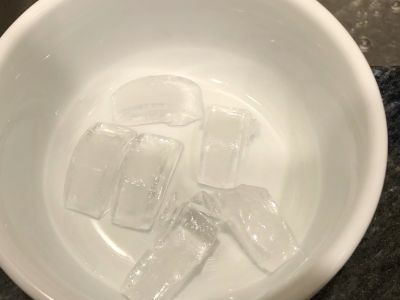 If your tap water does not run very cold, add a few ice cubes. Ideally the water temp should be about 40° F which is right around refrigerator temperature. 3. 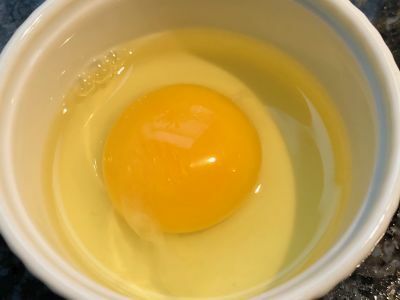 One egg at a time, break an egg and add it into the ramekin or other small bowl. 4. 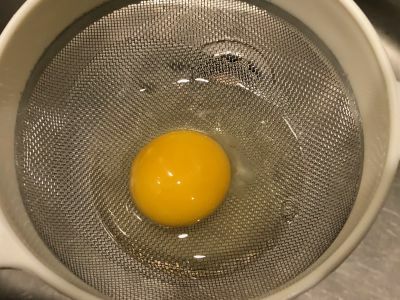 Carefully pour the egg into the mesh strainer and very gently swirl the egg around to separate the outer layer of albumen from the egg. 5. Pour the egg into the shallow sided bowl and repeat the process for all the eggs. 6. 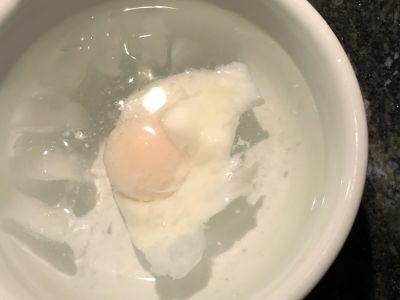 When the water is heated in the frying pan, gently pour/slide the eggs into the water one at a time, trying to get the bowl as close to the water as you can without burning yourself or getting water in the bowl. You do this to make sure you don't break the yolks during this process. 7. Start a stopwatch or timer so you can keep track of time. 8. After about 20 seconds, gently slide a slotted spoon under the eggs one at a time to make sure they are not sticking to the pan and to swirly them in the water a little bit. 9. During the cooking process, every 30 seconds or so, gently swirl the eggs again so they cook evenly. 10. They will take between 2 1/2 to 3 1/2 minutes to cook. What we are looking for is a cooked white and a soft yolk. This may take some experience because there is no exact science or time here. 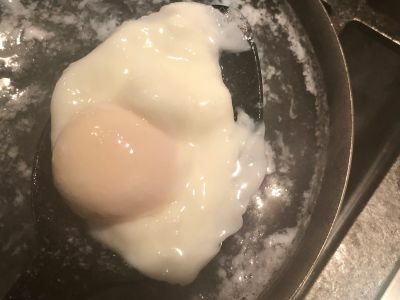 It is a function of the size of the egg, the temperature of the egg, the temperature of the water, the age of the egg and sometimes just whatever else the egg wants to do. You will get good at it over time, don't worry. 11. 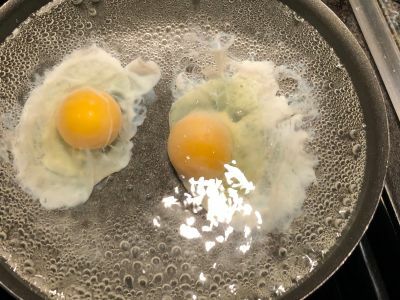 In the picture below, these two eggs were from the same carton, were handled the same way, were cooked the same amout of time in the same water but still you can notice a difference in the way the yolks behaved. So pay attention to each egg. Although even though they look different, they were both cooked just about the same after reheating. 12. 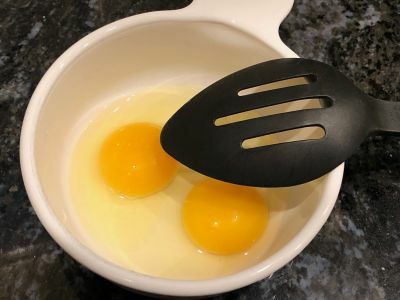 When they are cooked the way you want them, remove them one at a time with a slotted spoon and use them immediately or follow the instructions below for Storing the Eggs for Later Use. 1. If you are using the eggs later or you need to make more eggs, when you remove them from the frying pan add them to the bowl of cold water. Cover the bowl and place it in the refrigerator until you are ready to use the eggs. Supposedly you can leave them in there for several days but personally I use them within a day. Up to you if you want to try or have a pressing need to go longer. 1. 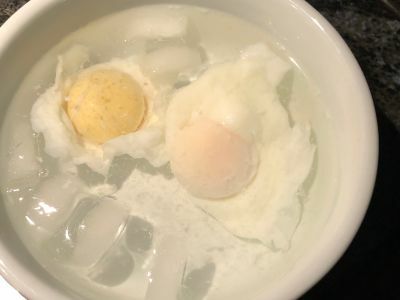 Remove the bowl of eggs from the refrigerator. 2. Fill a bowl or pan that is large enough to hold the eggs with hot water. Since most kitchen faucets probably deliver water that is around 120° F you might want to heat it slightly. We want the water to be right around 140° F to get the eggs warm enough but not to cook them any more. If you have a sous vide unit the would be perfect. Just a word of caution, you really should be using an instant read thermometer to test water temperature. Burns are a function of time and temperature. So if you stick your finger in 140° F water for 6 seconds, you can sustain 3rd degree burns. Be careful! 3. We want to leave the eggs in the hot water for about 2 minutes so judge accordingly with the other parts of your dish. And we are not trying to "cook" the eggs here, we are merely trying to warm them to eating temperature. 4. When you are ready to assemble your dish, remove the eggs one at a time and plate them. And you may want to dab them with a paper towel or a dish towel to get some of the excess water off the eggs. This is not required but you can do it if a lot of water pools on top of an egg. Poached eggs make a great addition to many dishes so it is a good skill to have to be able not only to poach eggs, but to do it for a crowd. If you can serve Eggs Benedict or Corned Beef Hash to a crowd of 8 people, you will be the envy of everyone there.